Two reviews close out the month of August here at SuperPhillip Central. 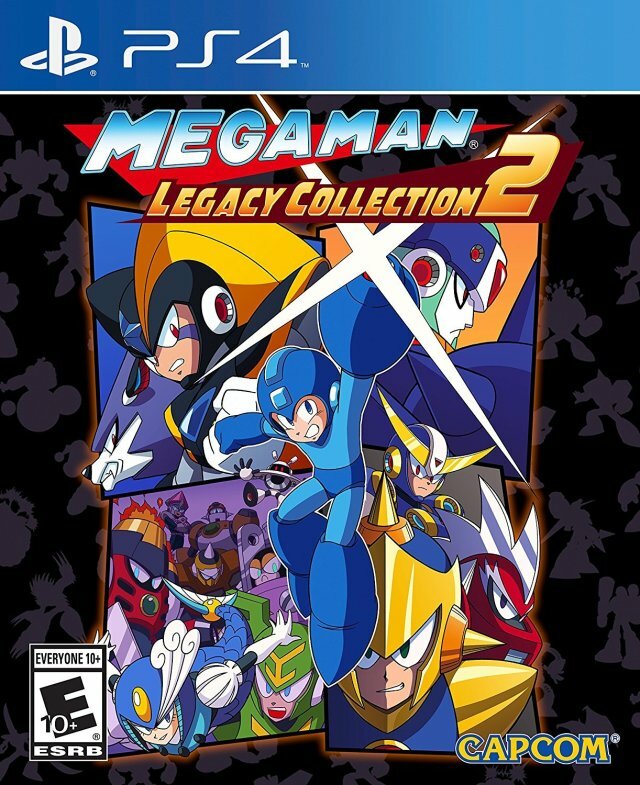 The first review is tonight with this in-depth review of Mega Man Legacy Collection 2. Here it is for all readers and passersby to enjoy! Despite including six full games in its previous collection of Mega Man games, this time around, Capcom merely offers four games within its newly released Mega Man Legacy Collection 2, including Mega Man 7, Mega Man 8, Mega Man 9, and Mega Man 10 (the latter two games featuring all of the downloadable content from their original releases last generation). What -- you can't even include Mega Man & Bass as a bonus here, Capcom?! ...Calming down here, also featured in the collection are art galleries, sound tests, and extra challenges separate from the game menus, offering stage remixes, boss rushes, and Buster-only runs for earning medals and comparing your best times with the world via leaderboard. 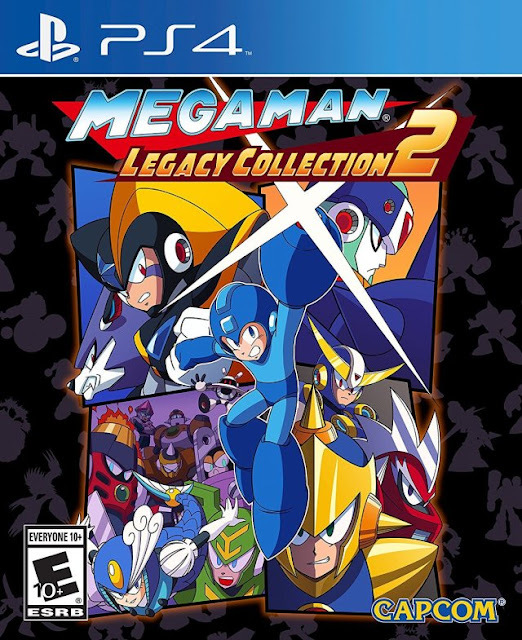 Unfortunately, what Mega Man Legacy Collection 2 lacks even from its predecessor's catalog of games is some tools that would help modern gamers that aren't so skilled or hardwired in playing these deviously challenging games (well, not so much Mega Man 8). The original Mega Man Legacy Collection offered save states where you could save your progress literally anywhere, so if you died, you could just load up your save from its state and return playing from there. Instead, what is offer is much more limited, such as being able to return to a handful of specific points in levels and something titled the "Legacy Mode" which cuts down how much health you lose when you take damage. These replacements are nowhere near as helpful or desirable as the previous collection's options. They become even more disappointing omissions when you have certain games in Mega Man Legacy Collection 2 that supply you with an extremely limited number of checkpoints, where losing all your lives means starting fresh in the level. Most seasoned players will not have a problem with this, but it will no doubt be a turn off for those lacking as much skill as needed for these games. As for the games themselves within the collection, let's start off with the earliest game in Mega Man Legacy Collection 2's roster of games. Heck, it only makes sense, right? Mega Man 7 was the classic Mega Man's only mainline entry on the 16-bit Super Nintendo -- so not counting the Japanese-exclusive Rockman & Forte. Mega Man 7 isn't a widely regarded game due to how different it plays and feels. 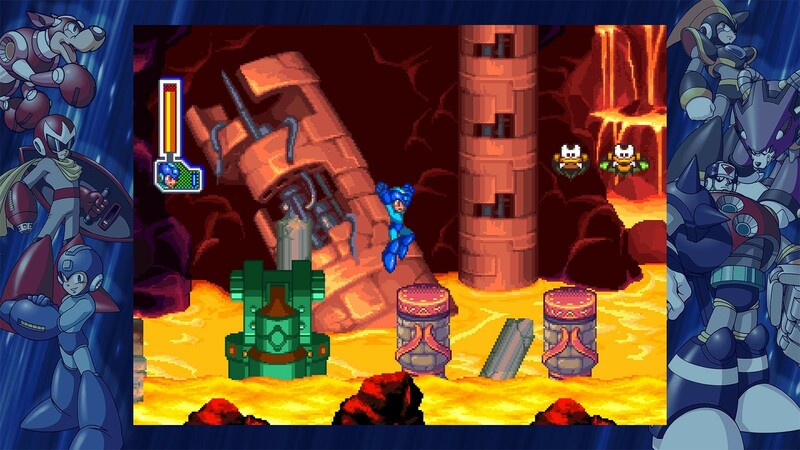 For instance, the sprites are much larger, and the screen space is much more limited compared to the Mega Man games before it. 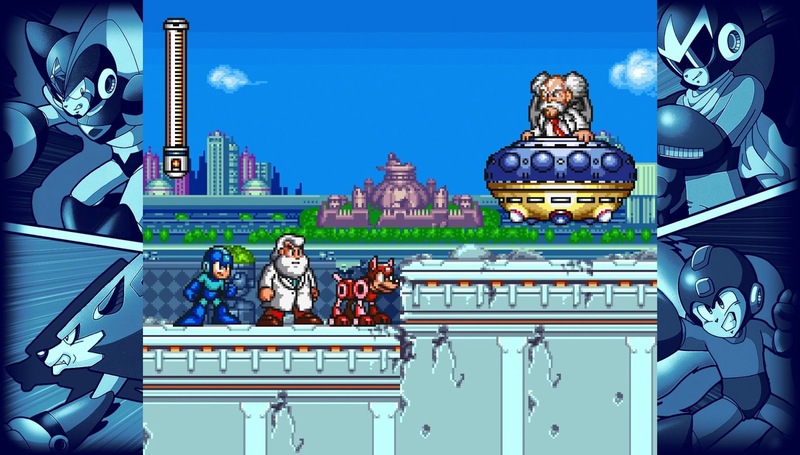 In Mega Man 7, Dr. Wily is back to being back to being back (etc.) to no good! Regardless, Mega Man 7 has a lot going for it. The colorful visual style of the series up to that point had never looked better and more vibrant, and the upgrade in hardware allowed for more awesome visuals and graphical effects. 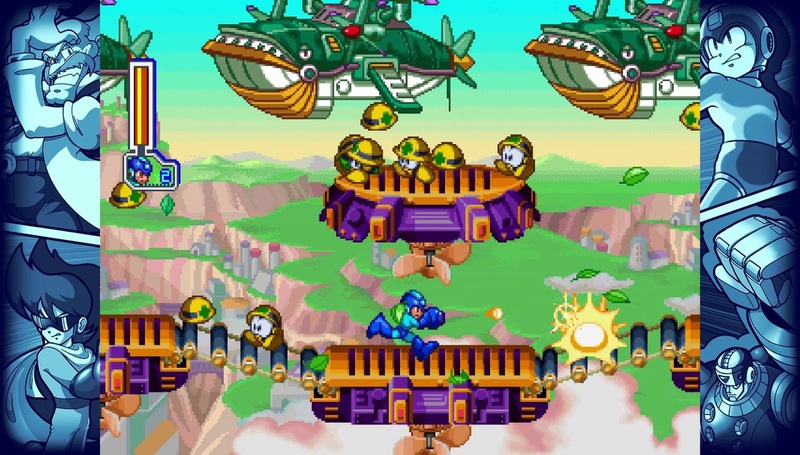 Mega Man 7 is the first Mega Man game to have a regular requirement of returning to levels to discover new power-ups. Mega Man 5 had the letters, yes, but you could get those on the first try through its levels. Moving on to my favorite game in the collection, Mega Man 8, which saw the Mega Man series as a whole move from Nintendo systems to Sony and Sega platforms due to Nintendo's decision to stick with cartridges for its Nintendo 64, a decision that would attract other third party developers over to other platforms. Of course, beauty isn't everything, but I still love Mega Man 8 otherwise regardless. Mega Man 8 is partly my favorite due to its general easiness in difficulty, while offering a good level of challenge, and partly due to nostalgia. It was the first classic series Mega Man game I had ever beat. Despite these things, other notable features that I really get enthused about Mega Man 8 is the vibrant and colorful art style the game uses, the woeful but so-bad-it's-good voice acting along with its better production values that the jump to the CD format assisted with greatly, and the game having the most longevity of any mainline game. I'm, of course, talking about hidden bolts in each level, in many of which you need to return to previously beaten levels to reach or find them with new Robot Master weapons acquired. The Robot Master weapons aren't just tools of destruction, but many could be used as means to reach and access new areas of level. 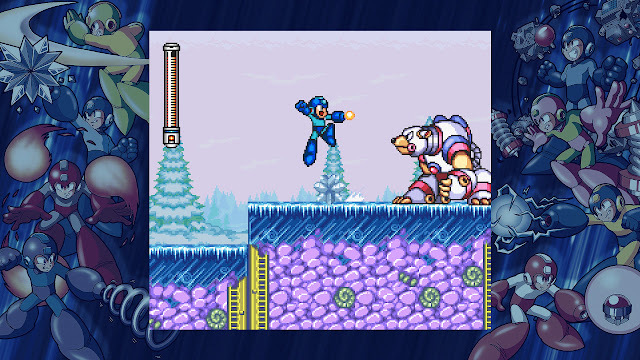 If you look to the sides, you'll notice an alternate border you can choose while playing Mega Man 8. Sadly, Mega Man Legacy Collection 2 uses the PlayStation build of Mega Man 8 rather than the more impressive and rare Sega Saturn build. Not only did that version feature better visuals and sound, but also extra content in the form of the return of two Robot Masters, Cut Man and Wood Man. Then, comes Mega Man 9 which unlike 8 before it has a much stiffer, brutal challenge to it compared to every other game in this collection. That's just one of the reasons why it's close to my least favorite mainline Mega Man game. From its "Gotcha! You're dead!" cheap moment and its fetish to make the game harder by throwing a cavalcade of spikes anywhere and everywhere in the game's levels, Mega Man 9 is not enjoyable for me, personally, to play. Cheap deaths don't result in fun; they result in an artificial difficulty, especially when you're forced to play long sections of level all over again just to get to the hard part at the end of that section and die from touching an awkwardly placed spike trap. This Robot Master certainly brought the heat to this battle. On the good side, Mega Man 9's selection of weapons is one of the series' best with pretty much every one of them having a beneficial use to take out foes instead of just having usefulness against a particular Robot Master. Mega Man 9's in-game shop also eases the burden with the ability to purchase (with the bolt currency found in the game) helpful items like extra lives and energy tanks to make it easier to endure the more sinister designed sections of levels. 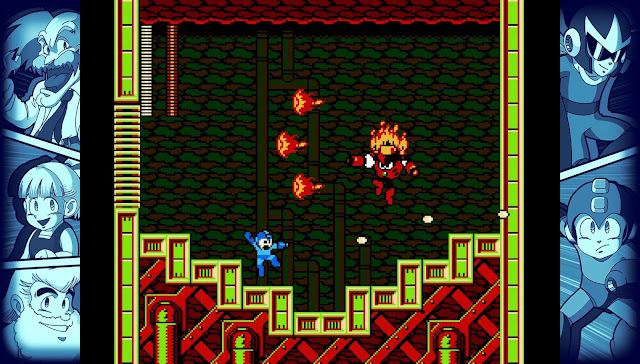 It decided to forgo the current path of modern Mega Man games by going completely retro, back to its roots in all of its NES-styled glory. Finally, there's Mega Man 10, which released shortly after Mega Man 9 -- perhaps too shortly as it tried to jump on the popularity of Mega Man 9 but felt like more of the same. Mega Man 10 does offer an easy mode unlike Mega Man 9, but this feels too insulting as it covers many spike traps and other dangerous jumps, making once challenging levels completely lacking in any difficulty. Still, the general difficulty of Mega Man 10 is ratcheted down compared to 9, and it's a more welcoming game for that. The addition of playing as Bass brings more replay value to Mega Man 10 as well. Mega Man Legacy Collection 2 brings the player many choices in how the various games are displayed and how they can be controlled. Each Mega Man game here can be played in its normal resolution, a more stretched out format, and formats that put borders around the screen space, all themed after the current Mega Man game being played (there's a selection to choose from). The button configurations for each game are available to be customized. For example, I put the dash button to Circle and the special weapon button to Triangle in Mega Man 8, just the way I used to play it in middle school. So, overall, there is an admirable range of playing each game in the collection the way you desire whether with presentation in mind or with regards to controls. Not only can you adjust the border, but you can also adjust the screen size for each game. While Mega Man Legacy Collection 2 may remove its migraine-preventing "save whenever you want" feature from the previous Legacy Collection and add a undesirable substitute instead, I can't really shame this second compendium of Mega Man titles down too much. It's but twenty dollars, offers four excellent Mega Man games, plenty of bonuses, and is just a good deal in general. If you're easy to get irritated, then maybe just stick with the original Mega Man Legacy Collection with its "save anywhere" functionality. For everyone else, Mega Man Legacy Collection 2 is worth it to see how far the series evolved from its NES days... and sort of de-made itself back into its NES days soon after.